My Ozarks is a collection of short, intimate portraits of real people, places and experiences in the Ozarks. Our goal is to increase interest in the Ozarks and help generate economic opportunities for artisans and entrepreneurs across the region, helping rural artists and innovators earn a living without leaving the communities they love. The first episode in the My Ozarks documentary film series introduces Jerica, a 15-year-old girl who gigs for suckers on the Current River with her dad, a tradition passed down for generations. She embraces the temporary reprieve from cell phone service and social media to connect with people in real life. We will be using this film to introduce new audiences to the exciting and unique sport of fish gigging, to expand river tourism into the winter months. At first glance Jerica appears to be like any typical 15 year old girl. However, her skills at gigging scaling, and filleting fish are extraordinary. This is a fact accepted by the camp. Her father exhibits a matter-of-fact pride in his daughter. Her body language reflects her father's confidence. She shows a strong desire to be in touch with her ancestry... Unlike many from her generation, Jerica finds she can exhibit her best when her phone has no signal. Robbie Williams is the authority on gigging. Within the gigging community Robbie exhibits a quiet leadership in directing the expedition. There is no frenzy, everyone knows what they need to do. He delivers that assurance. Without Robbie, there is no fish fry. Robbie Williams designs,builds and repairs boats as a profession. As to the Current River, he is the perfect guide. He knows where the river runs a bit too deep to gig. He is also a master at maneuvering his boat which guarantees a successful hunt. Fourteen years ago, Ian McGee left his hometown of Doniphan, Missouri to pursue a career in art. Now, he lends his creative vision and experience to the My Ozarks project as a filmmaker and mentor for our first documentary short film series. Find more of his work at thepaintshop.co. To "angle" or "fish" is to passively lure a fish to your hook... To "gig" is to hunt the fish with a spear. The plan was to have a fish fry. The rub is, you have to have a fish to fry. The drive to the launching point was longer than expected. The road wound up-and-downhill with curves and potholes that could easily unhitch a trailer. As if on cue, a clearing appeared which revealed a gravel bar that led to the river. Two trucks shifted into reverse and backed their boats into the water. The sun was starting to dip behind the trees on the opposite bank. The crew knew what they had to do. A bonfire was lit and a fish fryer appeared. I had my doubts before we left, but the crew's almost tribal execution erased all doubt. Tonight we are going to have a fish fry. The sun is now below the trees on the opposite bank. The temperature has dropped to 10ºF. The boats are underway and the bow lights are illuminating the water. We lean on the bow rails looking for suckers. The ten foot pole is awkward to maneuver with the current forcing the trident under the boat. Out of no where the suckers begin to appear in the light, darting about with the current.The large suckers, or hogsuckers, are especially vulnerable at night. The spotlights cause them to stop in their tracks as if they are stunned. The first few lunges are not fruitful. A hogsucker appears, sitting in 2 feet of water... maybe 3 feet off starboard. A deliberate lunge and he's in our fish hold. Score! The feeling of spearing a fish is more intense than reeling one in. The adrenaline rush gives one a warm feeling which defies the frigid temperature. Hearing the fish flop in the hold is a wonderful sound. Within one hour we have gigged enough for the whole camp to enjoy. The boats hit the gravel beach of the campsite. The crew assembles around the campfire. Three small stations are manned. There is an informal pecking order associated with the stations. The less experienced (or young gigger) scale the fish. The more experienced fillet the fish. The seasoned gig master breads the fish and throws it into the fryer. The fish fillets are breaded with corn meal and are fried with onions and potatoes. An Ozark version of fish and chips is the result. The fish taste is remarkably fresh... Perhaps because of the cold fast moving water they reside in. 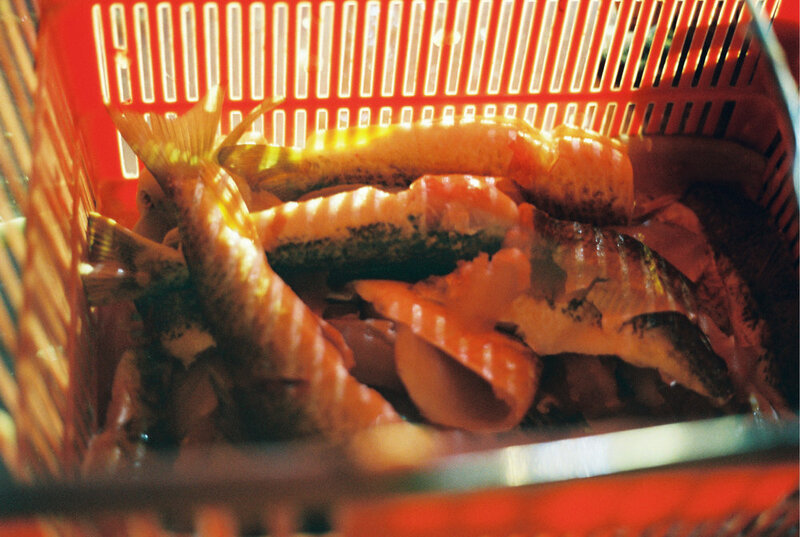 The bones melt away in the fryer which makes the fish easy to consume. The steam from the fryer and the roaring bonfire make for a cozy atmosphere. Good food and drink are a natural lubricant for good conversation. Old bonds become stronger and new friends are made. Strong community is a long held tradition in the Ozarks. This tradition evolved out of the rocky terrain and economic isolation that has defined the region. During the late 19th and early 20th century there was almost no industry and little commerce in the Ozarks. Logging was the only industry that offered any kind of cash income to Ozark families at the time. Stores that provided basic food supplies were few. Therefore, families had to rely on the natural resources that surrounded them to survive. The terrain was not suitable for row farming. The rivers and springs would provide the sustenance needed to survive. Out of necessity the practice of “gigging” would become an essential skill which ensured a family was well fed. There are primarily two species of suckers in the Ozarks. The Northern Hogsucker and the Yellow Sucker (Golden Redress). Suckers are shallow water bottom feeders. They can be gigged during the day, but nighttime is best for catching the large ones. Ozark waterways are shallow and run fast. A wide variety of fish species reside in the habitat. Suckers are especially plentiful in the Current River. They can be caught by traditional reel and rod methods but gigging suckers is more efficient and exciting. Hunting is at it's best after dark and during the cold fall and winter months. 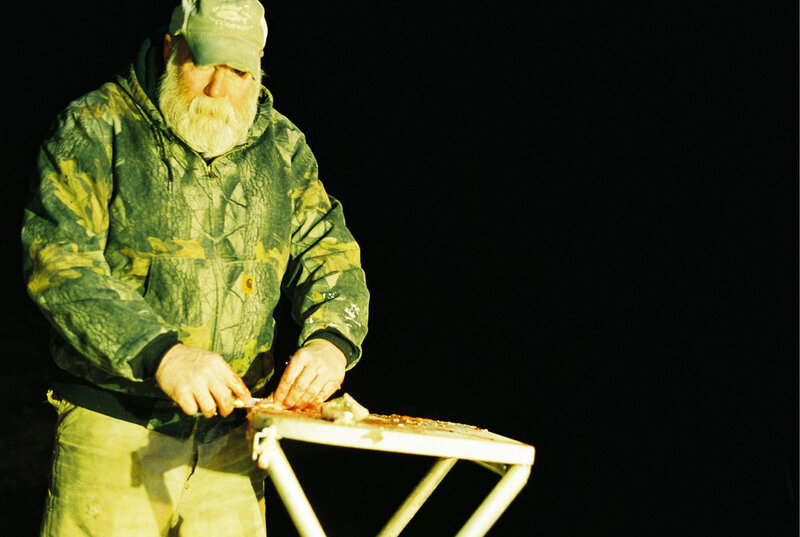 The use of spotlights help to stun the larger fish making them easier to gig at night. Over the years, through trial and error, the gig was developed. A gig is a long pole with a multi pronged trident-like attachment at the end. There are many different variations but most gigs have 3 or 4 bearded prongs. The evolution of the gig, from wooden closet poles to the modern fiberglass pole, made it possible to efficiently hunt suckers. Today, the sport of gigging is seeing a resurgence in the Ozarks. In Van Buren and Doniphan, Missouri along the Current River, there is a thriving community of gigging enthusiasts. Gigging season runs from September 15 through January 31st.It is the perfect opportunity for families to reinforce their bonds. Van Buren and Doniphan are perfect getaways for a fall weekend. 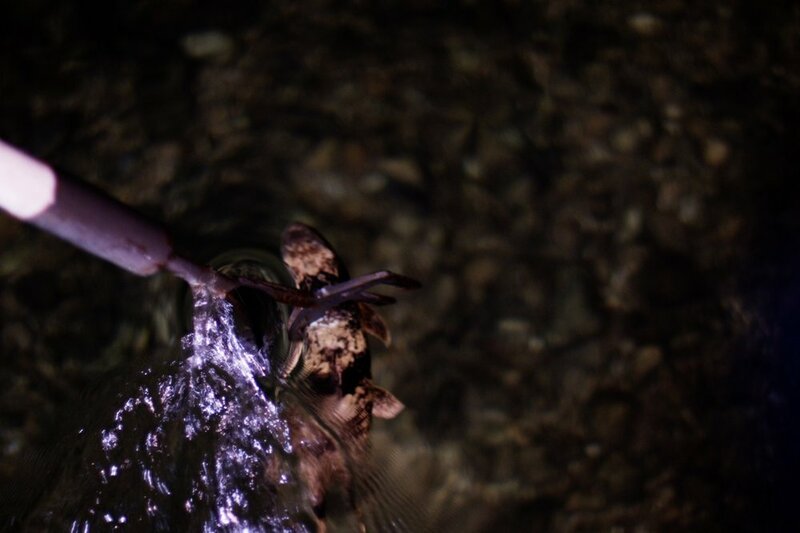 Experiencing the visual beauty of the changing leaves during the day and going on a gigging expedition at night will satisfy any outdoor enthusiast. Concluding the day with a delicious fish fry on the banks of the Current River is a remedy for anything that ails you. Interested in more Ozark stories? The second episode in the My Ozarks documentary film series tells the story of the 2017 Ozark floods and what makes it worthwhile to stay and rebuild, from the perspective of a 6-year-old boy helping his mother, grandmother and great-grandmother rebuild their homes and their lives in Van Buren, Missouri. Copyright 2018 Ozark Vitality. All rights reserved.